Account Category - one of the required fields in the Account Maintenance window - seldom seems significant except to those companies that use AFA (Advanced Financial Analysis). AFA uses the Account Category in presentation of financial reports. But for the fact that it is a required field, it is mostly ignored. You could enter any Category in any account and suffer no ill consequences unless you are using AFA. However, did you know that FRx can use the Account Category also? In the 'Link to General Ledger' field in FRx, click the drop down arrow to open the GL Account Links window. The window opens with the 'Account Code' radio button selected by default. Select the 'Account Type' radio button. The GL Account Links window changes appearance. 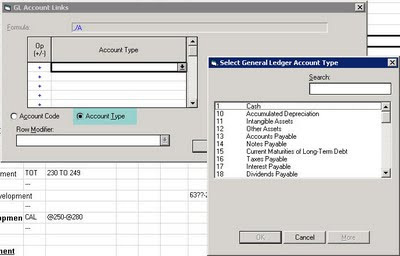 Click the drop down arrow in the Account Type field and the 'Select General Ledger Account Type' window opens. See the Account Categories? By selecting the desired Account Category, all the accounts associated with that category will be selected for that row in the FRx Row Format. Finally! A reason to make sure your Account Category settings are correct and meaningful! Good post, Frank. The other great reason to effectively use Account Categories is to take full use of the entry level BI tool for GP, Analysis Cubes for Excel. 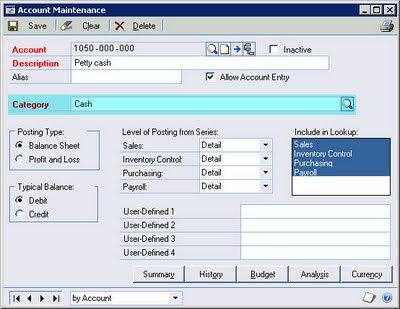 ACE uses the Account Categories as the basis for creating a very powerful Accounts by Account Category hierarchy in the Accounts Dimension, allowing for very good reporting and analytics. This is good information Frank, especially since many people really don't understand the point of Account Categories and will just set it to 'CASH' because they don't see the relavance. One note you might want to add as food for thought when using them in FRx is if companies choose to create their 'own' categories, other than the 48 pre-defined ones, they will not be available in FRx to select from. 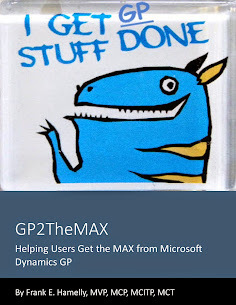 This being because GP uses the Account Category ID, not the name, to pull the field into other applications, such as FRx and Excel-Based reports. By default, when custom categories are created, they are not assigned ID numbers nor is it possible to give it an ID number from the Account Category window in GP. Thanks Dwight and Lisa - great additional info! Oddly enough while the GP window does not show numbers past 48, ACCATNUM.GL00102 still holds a number that is incremented past 48 when records are added.